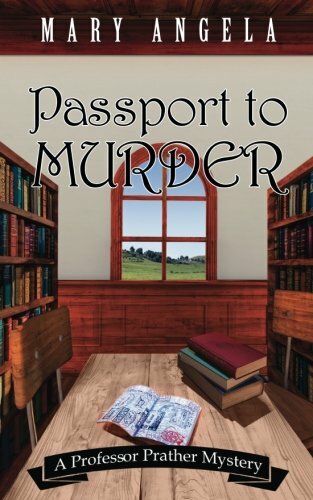 In “Passport to Murder,” author Mary Angela brings to life a likable and charming protagonist in Professor Emmeline Prather. Professor Prather is preparing for the trip of a lifetime to Paris, France with her students and colleagues when tragic strikes during their flight. Professor Prather, already unraveled by her fear of flying, is catapulted into a nightmare of events. A professor is killed and Professor Prather is determined to find out who committed the act that ruined their trip. Professor Prather enlists her right-hand man, Lenny Jenkins, to help her sort through the evidence. The tangled investigation is bound to cause Professor Prather and Lenny some problems, but that does not stop them from trudging forward. Mary Angela describes the town of Copper Bluff as a picturesque, scenic get-away for any city dweller, and the college campus in such a way that transports the reader right into Professor Prather's classroom. The town of Copper Bluff reminds me of my own college town in Ohio, where I spent much of my time learning from an English professor like Professor Prather. I was immediately transported back to my days spent gazing out the classroom window to the leaves falling to the ground on a crisp autumn day. Professor Prather proves to be a strong, intelligent and well-developed character. When I think back on my time attending college, my English professor was a driving force in my love of books and literature. Professor Prather encourages her students to be creative and proves to be a positive influence on her young students. Mary Angela has created a character in Emmeline Prather that is genuine and caring. Professor Prather is a modern-day heroine who uses her cleverness for the greater good. “Passport to Murder” left me hanging on every word as I tried to solve the mystery before the conclusion of the book. While the ending was an unexpected surprise, Mary Angela was able to tie-up the loose ends and answer my burning questions. She has a talent for painting a picture for her readers using descriptive adjectives and natural, flowing dialogue between characters. I enjoyed how Angela brought to life the relationships between characters by using dialogue constructed of witty banter and heated arguments. “Passport to Murder” is a strong follow-up to Angela's debut novel, “An Act of Murder.” The Professor Prather mystery series is meant for mystery lovers of every age. Avid readers, like myself, will especially love and relate to a fellow bookish heroine like Professor Prather.